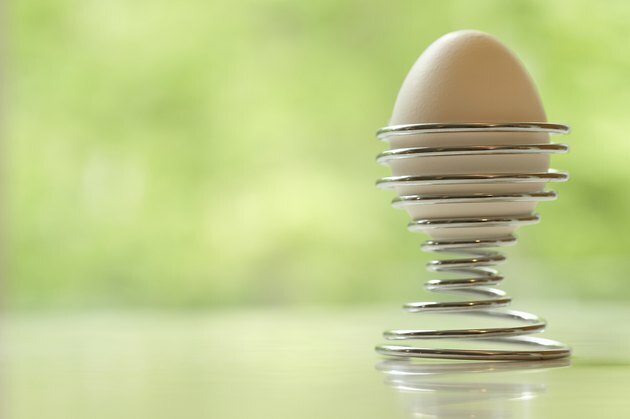 Are Hard-Boiled Eggs Good for You? In the 1960s and successive decades, media stories linking eggs to cholesterol and heart disease proliferated, leading to reduced consumption. The nutritional benefits of eggs, however, appear to be climbing back into the spotlight. In 2009, Americans each consumed an average of 248 eggs a year, and 93 percent of households included eggs on their grocery lists. One of the most common methods of preparing eggs is by hard-boiling them, or submerging them in boiling water in their shells until the yolks and whites are cooked through. The protein one large hard-boiled egg provides is 6.3 g, or 13 percent of the FDA daily value. Protein contributes to a variety of functions in the body, including normal growth and development. Pregnant and breast-feeding women particularly benefit from consuming protein, because of the additional dietary demands of fetal and infant growth. One hard-boiled egg provides 5.3 g fat, or 8 percent of the 65 g daily value for the average adult on a 2,000-calorie diet; 1.6 g saturated fat, which is 10 percent of the 15 g daily value; and 186 mg cholesterol, or 62 percent of the 300 mg daily value. The body needs fat to fulfill particular functions, including dissolving and absorbing fat-soluble vitamins A, E, D and K, though too much cholesterol in your diet may increase your risk of heart disease. The National Institutes of Health recommends consuming no more than four whole eggs per week. If you a history of heart disease, it's particularly important to limit eggs yolks, which contain most of an egg's cholesterol. A hard-boiled egg provides 15.4 mcg of selenium, or 22 percent of the 70 mcg daily value. Selenium is an antioxidant that protects the body's tissues from the harmful compositional changes metabolic toxins can cause. You may help curb cardiovascular disease development and the effects of aging by consuming an adequate amount of antioxidants. A hard-boiled egg provides 44 IU of vitamin D, or 11 percent of the 400 IU daily value. A mild deficiency of vitamin D is not uncommon among Americans. The nutrient is primarily provided in animal foods such as dairy, fish and meat. The body needs it to absorb calcium and create the structure of bones. What Are the Benefits of Poaching Eggs? How Many Calories Are in Cooked Egg Whites?